- The gold price rose 3% during the last COT reporting period. - Despite that large rise in the gold price, speculative longs only added a little over 17,000 contracts which is lower than we would have expected. - Surprisingly, speculative shorts added to their short positions during this large rise in the gold price which is very unusual. 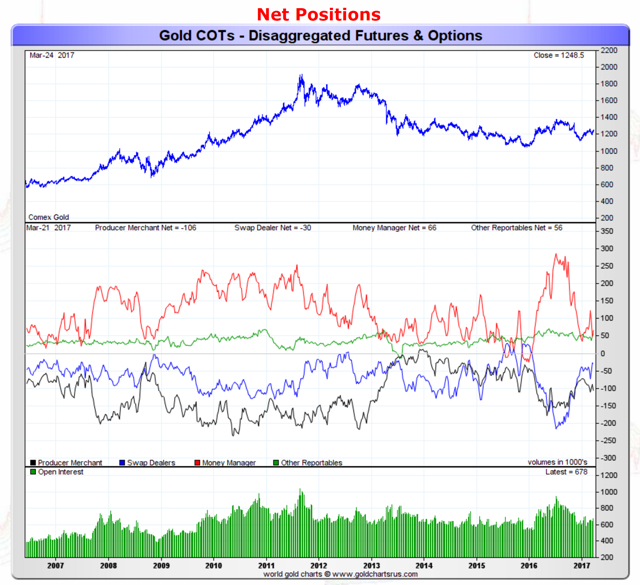 - Despite the rise in the net speculative long position, the historical net speculative position in gold remains low. - Speculative US Dollar traders added to their own net long position in the USD to the highest levels since January, which is USD-bearish and gold-positive for contrarians. The latest Commitment of Traders (COT) report showed a decent increase in speculative long positions, which was expected due to this report's inclusion of last week's change in gold post-Fed meeting. But surprisingly enough, this report showed that speculative shorts increased their positions despite the 3% rise in gold during the COT week. That is a bit unusual as we tend to see speculative positions mirror the gold price (rising gold means rising longs and falling shorts), and that is especially the case on big (2%+) moves in the weekly gold price. The only times we usually see the opposite is when the net speculative position is at extremes like back in July of 2016 when the net speculative position was hovering at record levels - but at current levels we are actually at fairly low speculative net long levels. This week's report showed an increase in speculative gold positions as longs by 17,687 contracts during the COT week while shorts added 1,551 contracts to the gross speculative short position. 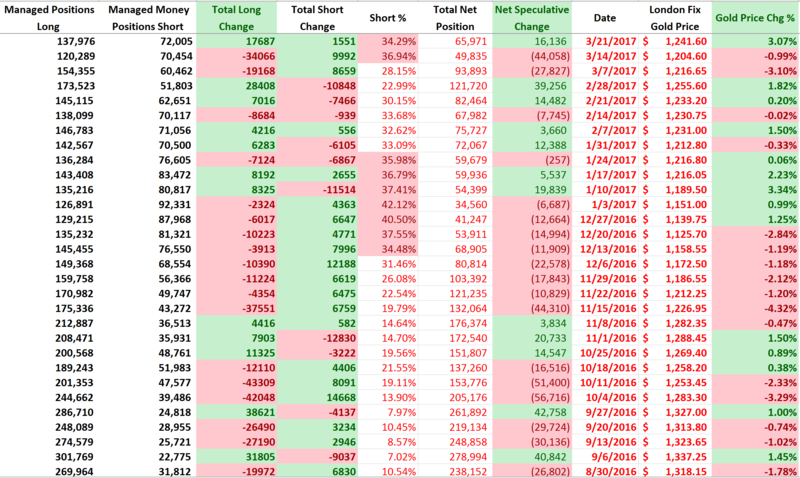 Interestingly enough, despite the rise in the gold price and what could be construed as a gold-positive Fed meeting, speculative shorts continued to add to their gold position. The red-line represents the net speculative gold positions of money managers (the biggest category of speculative trader), and as investors can see, we saw the net position of speculative traders increase by 16,000 contracts to 66,000 net speculative long contracts. We would have expected much more based on the rise in the gold price for the week. 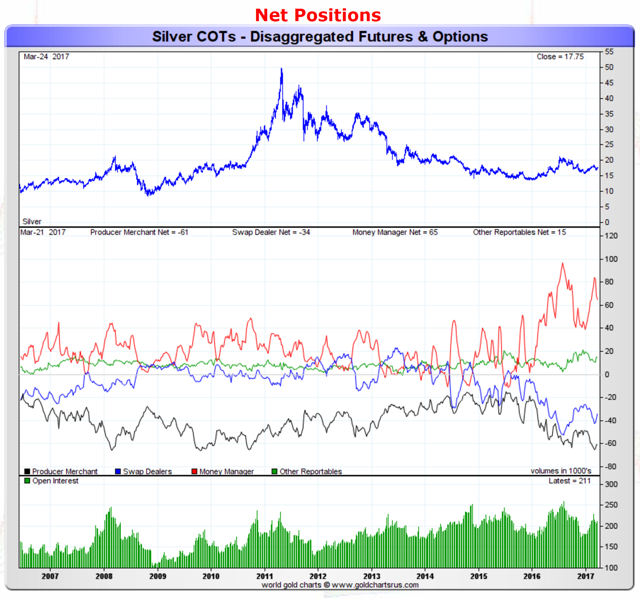 The red line which represents the net speculative positions of money managers, showed a slight drop in bullish silver speculators as their total net position dropped by around 2,000 contracts to a net speculative long position of 65,000 contracts. Speculative behavior in silver followed that of gold this week as the metal rose yet long positions fell (and short positions rose). · In top consumer China, premiums fell to about $10 to $12 an ounce against the international benchmark from levels over $20 last week. · Premiums were quoted from 70 cents to $1.20 in Hong Kong, from the 70 cents to $1.10 an ounce level seen last week. · In Singapore, premiums were seen slightly lower, within the 80 to 90 cents range, against $1.20 an ounce in the week before. · In Japan, traders saw the precious metal at a discount of 50 cents to a dollar, unchanged from last week, attributing it to the lack of any significant move in local prices. It seems physical demand in Asia is muted due to the rising gold price. The one exception was India, which saw rising demand despite the increasing gold price as jewelers stock up for a festival next week. Based on those numbers, we cannot really envision Asian physical demand being a driver for the gold prices last week. Moving on to the US Dollar, it seems that speculators increased bullish bets on the U.S. dollar for the third straight week, pushing net longs to their highest since Jan. 31, according to calculations by Reuters. We really have no strong feeling on the direction of the US Dollar from here, but if it continues to drop as US Dollar speculative longs add to their positions then that could lead to a "long-dump" as over-leveraged US Dollar longs exit their positions - which would of course send the Dollar lower (and probably send gold much higher). We are watching the US Dollar carefully because it looks like speculators may be positioned incorrectly here as they expect a Dollar rebound, which may not come. Also, investors need to remember that the US administration has already mentioned its desire for a weaker Dollar - would it be that surprising to see the US Dollar drop further? We do not think so. It is a bit premature for that, but this is an important catalyst for gold investors to watch. This week was an interesting week as the gold price increased significantly BUT we saw speculative shorts also increase their positions - which is a bit unusual. Additionally, the speculative net long position in gold is around 66,000 contracts, which is fairly low historically (we hit 250,000 contacts at the top of last year's rally) and suggests we are closer to a bottom in the short-term gold price than a top. One other thing to note for gold investors is that speculative US Dollar long positions rose to the highest levels since January. We wouldn't be surprised if there is a bit of a double-leveraged trade going on here as speculators go long the US Dollar and short gold, which would explain the strangely rising gold short position. From a contrarian view that's a positive as it means that there is plenty of room up for gold and down for the US Dollar (longs are currently piling in). Last week changed our short-term picture of gold from neutral to neutral-bullish, and it seems like it was the right call as gold rose during the week. 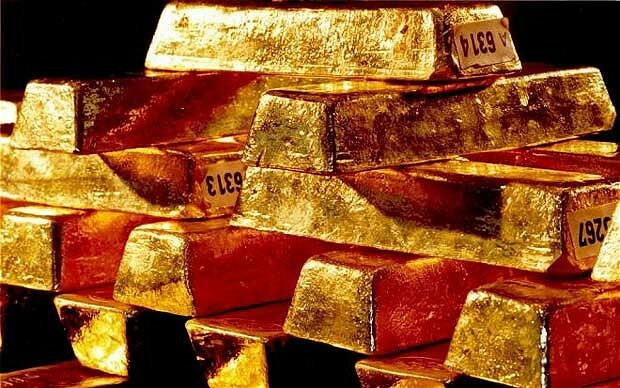 All the previous factors strike us as bullish for gold but the big concern we have is that the failure last week in the Trump administration's efforts to repeal the Affordable Care Act (Obamacare) suggest that there may be some major questions on if Trump can implement his tax and infrastructure plans. Since this is what much of the US stock market's rally seems to be based on, that may mean a pull-back, a correction, or something much bigger. We are simply not certain what this would do for gold as on the one hand weak stock performance is generally good for alternative, risk-off type assets like gold; on the other hand, taking away leverage from a market may lead to liquidation of all types of positions, including gold. We saw that in 2007 and 2008, and we certainly cannot count that out here. Thus we aren't ready to go completely bullish in the gold short-term picture just yet until we see some evidence that investors will "run to gold" with a drop in US stocks. As for silver, we are still not feeling very bullish on the metal in the short-term despite its outperformance with gold last week but we must acknowledge its correlation to gold (which we are more bullish on). Thus, we are changing our short-term picture for silver from BEARISH to NEUTRAL-BEARISH - while the upside is much greater than gold, we feel the risks here on silver outweigh the benefits when viewed holistically (i.e. upside potential versus downside losses). In summary, we are holding our gold positions here to wait and see what the US stock markets do as we already have good to exposure to gold via gold ETFs, like the SPDR Gold Trust ETF (NYSEARCA:GLD), and ETFS Physical Swiss Gold Trust ETF (NYSEARCA:SGOL). Since historical COT positions remain low, we would be viewing sizable drops in gold as a buying opportunity. 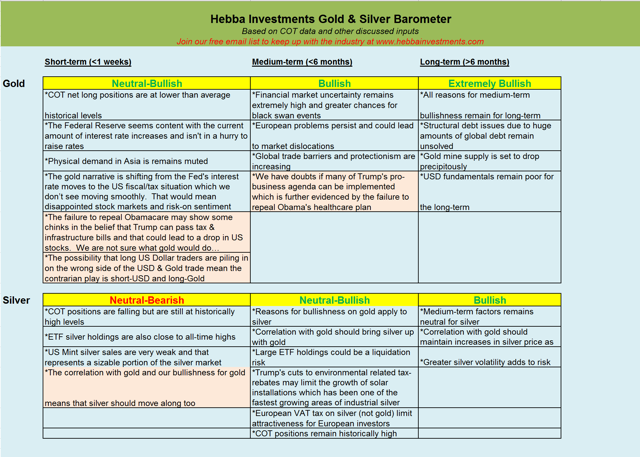 As we mentioned last week, we are still not ready to really begin aggressively adding to our positions in the silver ETF's like the iShares Silver Trust (NYSEARCA:SLV), ETFS Silver Trust (NYSEARCA:SIVR), and Sprott Physical Silver Trust (NYSEARCA:PSLV), as gold simply has a better risk-reward profile at the current time but with a further drop in silver we may consider buying back some of our previously sold positions. Finally, in terms of gold and silver miners, investors need to remember that they are stocks and could go either direction if stock markets fall and gold remains firm. If gold falls with stock markets, then investors need to expect miners to fall hard. The point here is that gold investors need to be careful with precious metals miners unless they are completely bullish on gold.